Hold on to Your Hats: "Vegging"
Today I would like to pass on a couple of healthy recipes. This week, inspired by my friend Lisa, I made kale chips for the first time. They were pretty good, but I think I made the pieces too small. Reed mostly wanted to crumble them in his hands since the texture was so fun and flaky… and Matt mostly wanted to know what in the world he was ingesting. Kale is a super food! "Kale is considered to be a highly nutritious vegetable with powerful antioxidant properties; kale is considered to be anti-inflammatory. Kale is very high in beta carotene, vitamin K, vitamin C, lutein, zeaxanthin, and reasonably rich in calcium. Kale, as with broccoli and other brassicas, contains sulforaphane (particularly when chopped or minced), a chemical believed to have potent anti-cancer properties. Boiling decreases the level of the anti-cancer compounds; however, steaming, microwaving, or stir frying do not result in significant loss. Along with other brassica vegetables, kale is also a source of indole-3-carbinol, a chemical which boosts DNA repair in cells and appears to block the growth of cancer cells. Kale is also a good source of carotenoids." (This kale chips recipe is from www.fitsugar.com. See the entire post here). 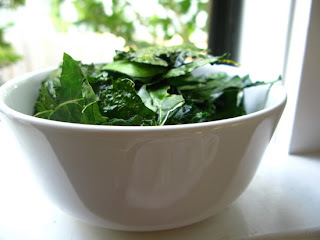 Remove stalks and ribs from kale. Rinse and dry leaves. Toss leaves in a large bowl with olive oil. Sprinkle leaves with sea salt and ground pepper. Arrange leaves in a single layer onto a baking sheet. Bake for approximately 30 minutes or until crisp. Transfer and let cool onto a wire rack or paper towels. 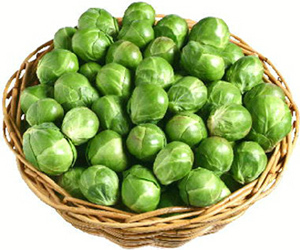 Brussel Sprouts happen to be in the same vegetable species as kale, which means they have similar nutritional benefits. This recipe was passed on from my mom and dad. Matt claimed he was too full to eat his serving, but I thought they were great. I even ate them as leftovers straight from the fridge for lunch. Yum! Preheat oven to 400°F. Remove tough outer leaves of the Brussels sprouts, rinse well, cut off the stem end. Slice in half vertically (through the stem end). Toss sprouts with olive oil and balsamic vinegar in a bowl. Pour onto a sheet pan lined with aluminum foil. Sprinkle sprouts generously with 2 to 3 pinches of kosher salt. Roast for about 20 minutes, until sprouts have begun to caramelize on the edges. Note: These can be made up to 8 hours in advance. Cover and refrigerate, then warm in a 300°F oven for 10-15 minutes prior to serving. Reed can eat both of these recipes, but we have a couple of other go-tos for super greens that he could eat when he was a little bit younger (8m+) as well. I’m a big spinach fan. It is nutrient rich and a GREAT source of calcium. Whenever I fix eggs for breakfast, we scramble them in the magic bullet with a few spinach leaves before cooking them. Reed probably thinks eggs are supposed to be green! Love it. We also add fresh spinach to smoothies in the magic bullet (or blender) for an extra (secret) burst of veggies. I add spinach to almost every salad we toss around here, and it also wilts beautifully into spaghetti sauce (or if you have little littles you could puree the spinach before adding to the(any) sauce, even freezing an ice cube tray full so it is always on hand). When Reed gets older, I think it will be fun to freeze yogurt and fruit (+ spinach!) smoothies into popsicle molds and serve him “popsicles” for breakfast! Who doesn’t love getting in a super veggie before 9am!? Any "vegging" tricks of your own to share? Comment away! Ummm.... you're insane-- none of my boys would consider eating such a thing-- I have to hide all our super greens, even from Chad! Good work, D!